At Dogtopia, your dog’s safety is our primary focus. Your furry family member will have a ball in our quality, safe, clean and fun playrooms that have been specially designed with their wants and needs in mind. As the premier dog daycare provider in North America, we have implemented proven safety measures such as double doors, soundproofed playrooms, rubberized flooring and certified pet-friendly cleaning supplies. 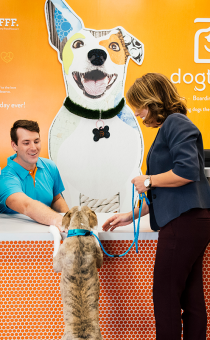 Each of our dog care facilities is designed to provide dogs and dog parents with the best experience possible by reducing odors, noise levels and the risk of illness and accidents. Our spacious, modern facilities average between 6,000 to 8,000 square feet. Some of our locations also feature outdoor space for your dog to enjoy. 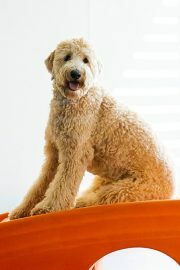 Free live webcams which allow you to see your pup playing with their furry friends, exercising and enjoying their day. 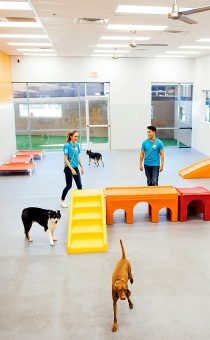 Playrooms that are supervised for all-day play by our certified Canine Coaches, who have extensive training and experience in managing multiple dogs at once. A comfortable, climate-controlled environment. Our HVAC systems keep your pup the perfect temperature during playtime and naptime, and constantly circulate fresh and clean air to keep the facility odor-free. 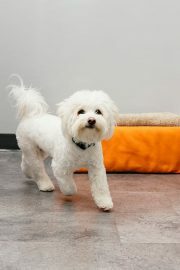 Playroom floors that are made from compressed rubber to reduce the impact on the pads of dog’s feet, joints and hips. The material is also easy to clean and reduces odor. Best of all, it will not adversely affect your house training. 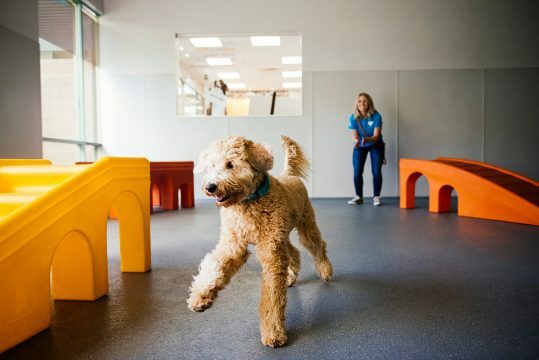 Safe and fun playrooms that provide everything an active dog needs, including plenty of space, climbing equipment and Canine Coach education to keep pups engaged and having the Most Exciting Day Ever. Each playroom has double-barrier doors to ensure safe and controlled entries and exits. A fully stocked kitchen where meals are prepared according to each pet parent’s direction. A custom cleaning program that utilizes pet-safe cleaning products which clean and disinfect while also offering the highest level of safety available. By using a bio-enzymatic cleaner for spot cleaning when the dogs are in open play, we are ensuring your pup is safe from hazardous chemicals. Daily cleaning happens twice a day with a sanitizer when pups are resting. We also perform routine detail cleaning to maintain our high standards. Home-style crates for naps, feeding, administering medications when applicable and overnight stays. Enclosed boarding suites for parents who prefer greater privacy for their dog during naps and overnight stays (available at select locations). 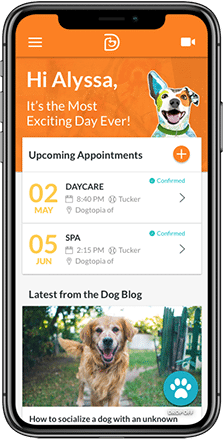 A free mobile app, which registered pet parents can use to request daycare, boarding and spa appointments, watch their pup play on our webcams, and more. Soundproofing throughout our facilities to keep nervous dogs at ease. A fully-equipped and professionally designed spa. Periodic report cards so you can keep track of your furry child’s progress and learn about new BFFFs (Best Furry Friends Forever). 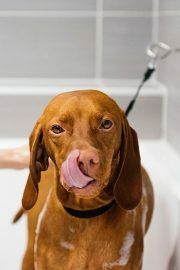 If you’re thinking of daycare or boarding your dog at one of our facilities, or just want to take advantage of our first-rate spa services, we offer free tours so you can determine if Dogtopia is the right fit for you and your pup. Find your nearest location to schedule a Meet & Greet.